there is little that the Marott hasn’t been a part of in it’s nearly 90 years of existence. The Marott as we know it today is the result of constant evolution since it opened in November 1926. These now elegant apartment homes started off as a hotel with a guest list including folks such as Clark Gable, Marilyn Monroe, John F. Kennedy, Bob Hope, Babe Ruth and Paul Newman. 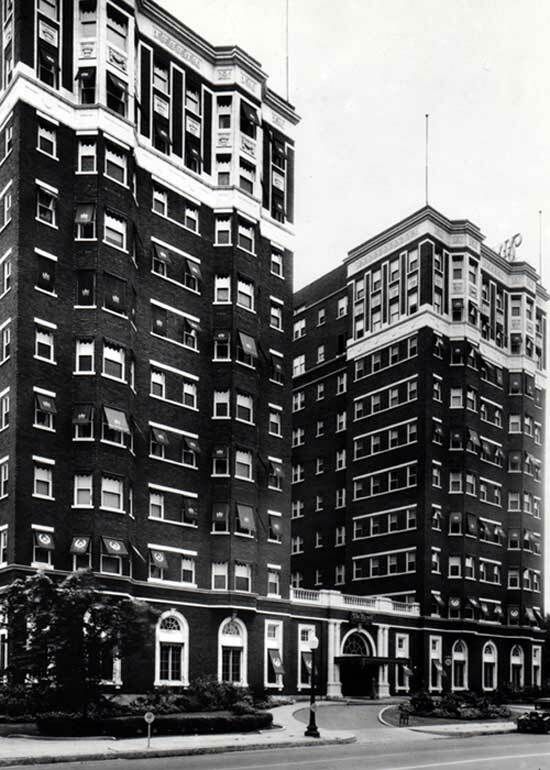 Located at the intersection of Fall Creek Parkway and Meridian Street, George Marott built his hotel to be the essence of luxury and elegance. Visitors who came into the city of Indianapolis knew it was the place to stay. The elegance of the façade and lavish interior quickly became the standard for the city’s finest families and visiting dignitaries, including several Hoosier Governors who made the Marott their official residence. In 1932, Winston Churchill chose to stay at the hotel during his visit to Indianapolis due to its international reputation for charm and quality. As the years past, the city began to grow and develop leaps and bounds. By the late 50s and 60s, the hotel was no longer in its prime. Improvement attempts were made with additions of an indoor pool and a new restaurant but the Marott was not able to compete with the new hotels going up around the city. In 1983, Ken Puller purchased the hotel and converted all of the units to one and two bedroom apartments. The $17 million put into the revitalization promised to breathe new life into the building that was decaying and leaky. However, in 1990 it was discovered that the property needed additional costly repairs and Puller decided to sell the property. Building upon his commitment to quality and integrity, Carl Van Rooy purchased the Marott in 1991 and – promisingly and quietly – began to inspire renewed interest from within the city and beyond. The Marott of today has evolved ten fold from the Marott of the 1920s. The building that once had billiard and card rooms, dining rooms, laundry service and valet parking – now has an updated indoor and outdoor pool. There are tanning beds, a coffee shop/business center and a 24/7 concierge sitting right inside the front door. The Marott also has local businesses utilizing space through out the building. The Marott, a name which symbolizes quality, style, elegance and commitment to the city of Indianapolis, lives on in its original magnificence and splendor.